Our second day in Sydney was a pretty full one. 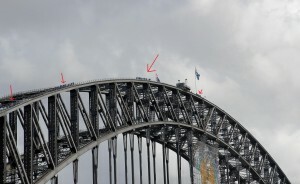 After crossing off #31 from my life list (climbing the Sydney Harbour Bridge), we were hungry and wanted to get breakfast. I suggested that we go to Pancakes on the Rocks , a famous establishment. The restaurant first opened in Sydney in 1975, and it was the first pancakes restaurant in the city. I’d been to Pancakes in Paradise on the Gold Coast, so I thought I’d be cool to check this place out too. We found the restaurant after walking around (and turning on Josh’s GPS on the phone and looking up the address on foursquare since we knew we were close). It wasn’t too crowded, so that was nice. The first thing we noticed was that the menu was HUGE. So many things to choose from. We wanted breakfast, so we went with pancake (of course). 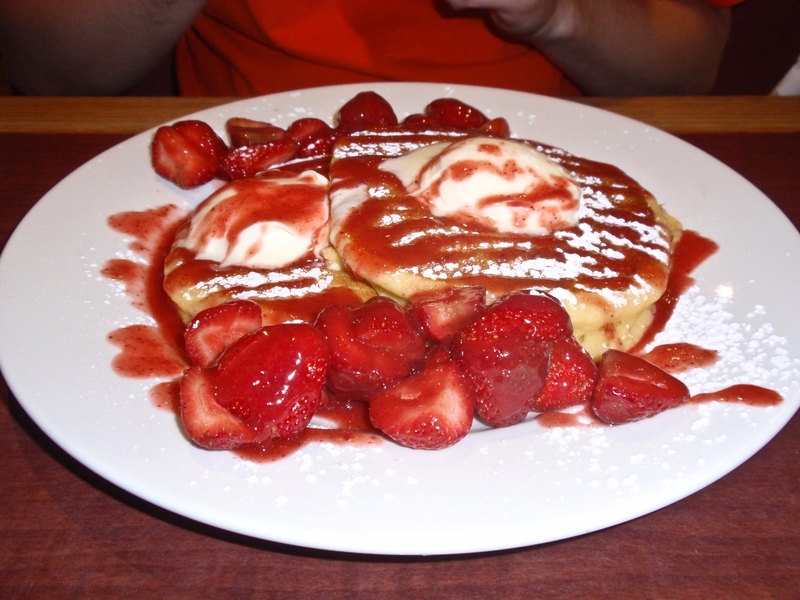 I ordered regular pancakes and eggs (boring I know), and Josh got the Strawberry Patch. Just like the menus, the meals were HUGE. 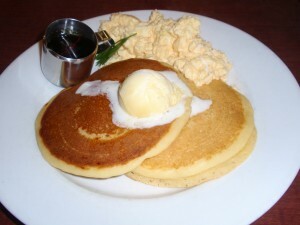 And look at the ice cream scoop sized butter on the pancakes! Needless to say, we were pretty full after breakfast! Next up on our agenda was a tour of the Sydney Opera House. When I visited Sydney back in 2003, we didn’t do a tour – just saw an opera – so I was really excited to learn more about the SOH. There are variations on two basic tours, the Backstage Tour (2 hours) and the Essential Tour (1 hour) [which is given in multiple languages]. We chose to do the Essential Tour, and since we booked online early (imagine that) we got a small discount off of our purchase (any little bit helps!). We arrived, checked in, and went to stand in the meeting area until our tour guide came to get us. He introduced himself, passed out our audio pieces so we could hear him talking on the tour, and we were off! 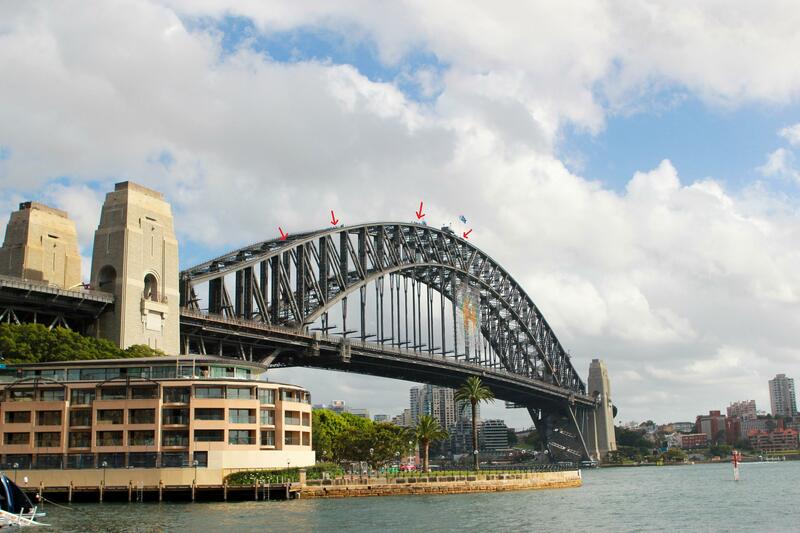 They Sydney Opera House was designed by Jørn Utzon, a Danish architect. 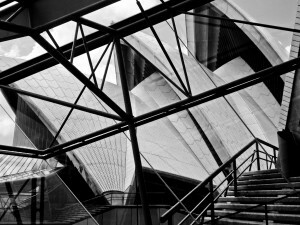 The city of Sydney created an international design competition where entrants all over the world submitted their designs for the opera house, Utzon’s design was selected in 1957. Construction began in 1959, and due to various factors ran over budget and took much longer than expected. In 1965, a change to the government party in charge took place, and after a few disagreements, Utzon resigned from the project. 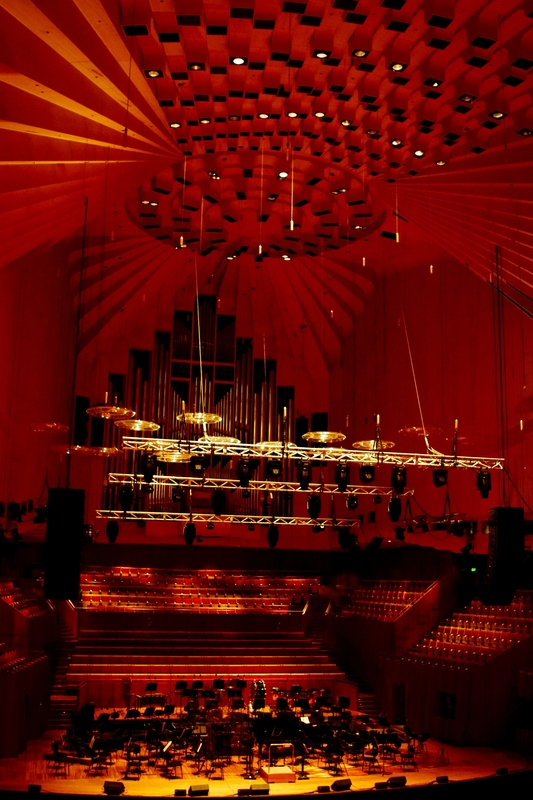 The Sydney Opera House officially opened in 1973, and Utzon was not present for the festivities. In fact, he never actually returned to the SOH after leaving the country in 1966. How sad! 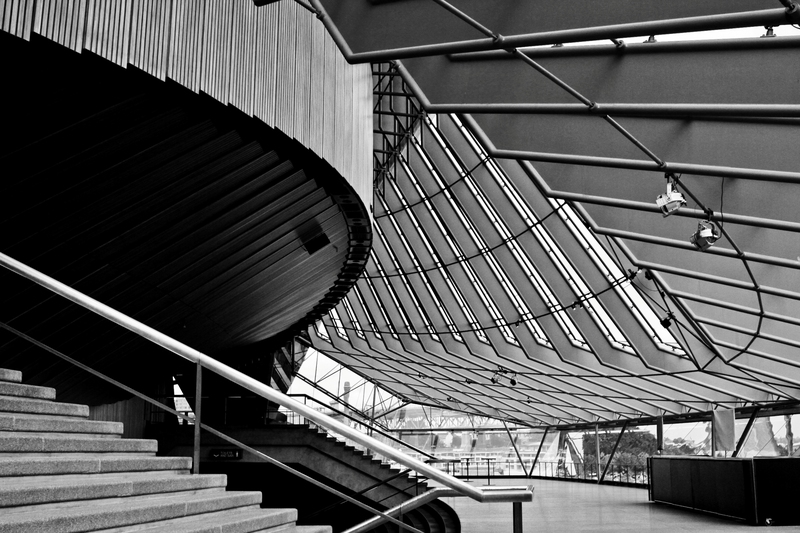 The inside of the SOH is a magnificent building, one of my favorites. The curves, the lines, just beautiful. On the tour we watched video clips, had the chance to see the Orchestra Hall, and see one of the stages being set up for an opera. While we were in the Orchestra Hall, there were no other groups viewing the room, and no one was on stage, so our guide let us take photos! I had heard you couldn’t take photos inside, so it was quite the surprise. I took a lot in the short span of time he let us take photos. When anyone came out on the stage, we had to stop, but luckily they weren’t there long and we could continue taking photos. After our hour tour was up, we walked outside to take a few shots of the exterior. I couldn’t help but hear two gentlemen talking about the NFL. 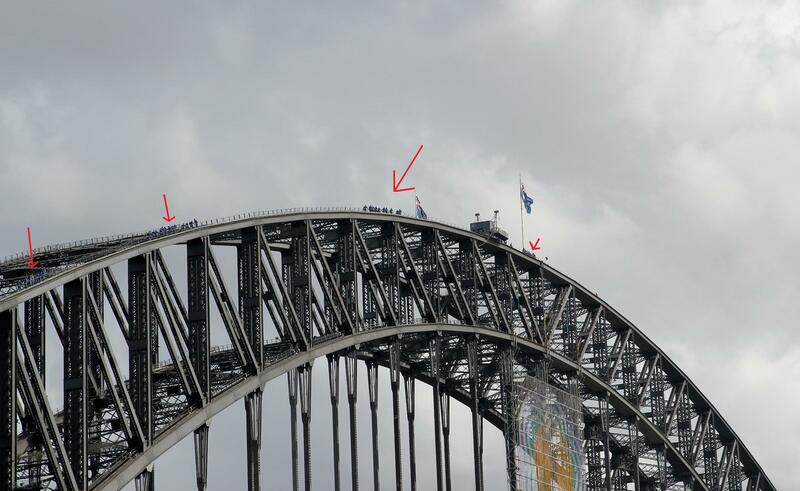 One was obviously an American, the other was an Aussie. He was a security guard standing outside of the SOH. They were discussing the Steelers and Eagles, and I chimed in about the Falcons. We discussed football for a minute before the other American went on his way. We ended up spending 45 minutes talking to the guard though! He was a huge New York Giants fan, which was really surprising to us. He told us that he and some of his mates would always head to a local Hooters to watch the Super Bowl every year. We looked at our clock and realized we needed to head back to our room to change clothes. We said good-bye and made our way back to the hotel. 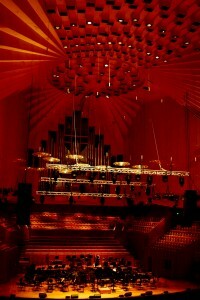 Original plans included a nap before coming back to the SOH to see the orchestra – but that clearly wasn’t happening now. Change of clothes made, we walked back down to the SOH and made our way to our seats for the Philharmonic Phireworks: Not New Years Eve matinee performance. We were right next to the orchestra. When the singers were performing, I was easily entertained. When it was just music, it was lulling me to sleep! I had to fight it off, it didn’t help that I’d been up since 2:45 am! Once the show was over, we took the long way back to the hotel (a.k.a. I suggested we go a route we didn’t need to go). Josh was hungry, so this didn’t go over well. I really just wanted to walk around the city and find a place to eat. Time was not on my side, the man needed to eat. We got back on track to head back to the hotel, when we decided to eat at one of the Japanese restaurant next to our hotel, Goshu Ramen Tei. 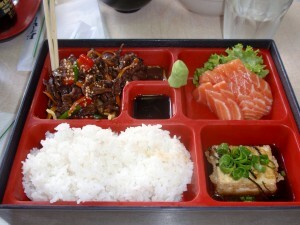 The food was delicious, and definitely needed since we hadn’t eaten anything since our massive breakfast. After dinner we were exhausted from the busy day and all of the walking. We went back to our room and were asleep by 9 pm! There was more of Sydney to see the next day, so we needed to rest up! They were indeed! I tried a bite of them and while I almost regretted my choice of thr plain pancakes, there was NO way I could have eaten the super sweet ones and felt okay afterwards! The view from the top of the bridge was spectacular! We enjoyed looking up at the bridge the rest of the week recounting our climb while watching others participate in theirs! No desire?? Really? It was pretty cool and not scary at all! The pancakes were pretty darn good, glad we stopped there!